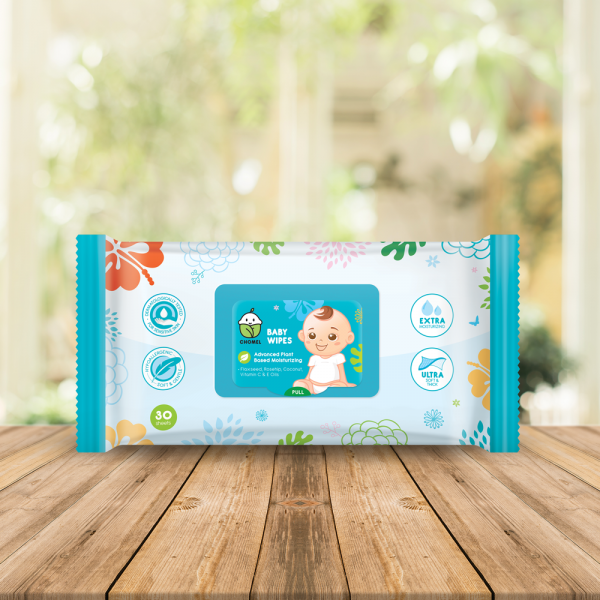 CHOMEL Baby Wipes – 30 Sheets – Childhood Basic Marketing Sdn Bhd. •	No synthetic, only Natural Flaxseed, Rosehip, Coconut & Monoi Tiare oils are used to help moisturize skin. •	Infused with Vitamin C & E to help strenghten the skin barrier making it healthy and soft. •	Open resealable sticker and gently pull wipes. Reseal sticker after each use to retain moisture. Store at room temperature. Do not flush. •	For external use only. Please discontinue use if prolonged irritation or redness occurs. To avoid risk of choking or suffocation, keep away from children. •	Aqua, Polysorbate 20, Linum Usitatissimum (Flaxseed) Oil, Trisodium Dicarboxymethyl Alaninate, Sodium Polyacrylate, Rosa Moschata Seed Oil (Rosehip) Oil, Cocos Nucifera (Coconut) Oil, Gardenia Tahitensis Flower Extract (Tiare Tahiti Flower), Tocopherol (Vitamin E), Ascorbyl Palmitate (Vitamin C), Sodium Lactate, Phenoxyethanol, Ethylhexylglycerin, Potassium Sorbate, Parfum/Perfume, Citric Acid.